Forming that perfect atmosphere within your coffee shop is key, creating that blend of décor, with the ambiance of a coffee shop is central to crafting that perfect in-store experience. 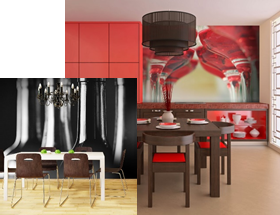 Wallpaper Murals will harmoniously bring together the contemporary vibe of a mural with the style of a professional barista at work with a charming mural. One of our murals will set the scene in any store-front, allowing you to do your best work while we do our, by providing the best quality mural for you. 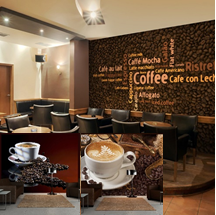 Once you set foot in a coffee shop decorated with a striking mural to match the décor you know you’re in the right place, the mix of senses is an amalgamation of what is just right for every coffee lover. Establishing the mix of flavors of visuals and taste is effortless when your restaurant or store-front is adorned by a mural from 3D Wallpaper Murals UK. Don’t be afraid to play around with these eye-catching recipes for a remarkable dish for the eyes. Every element of a restaurant is key to create that perfect atmosphere that patrons use to feel encapsulated by their environment, why not enhance that with an exotic clear treat for the eyes? 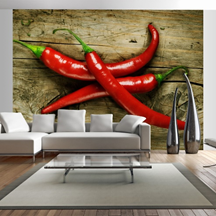 Restaurants with an experimental attitude with the array of spices and condiments to play with only bolster the vibrant murals we have to offer; the flavor will be bouncing from visual to plate in no time. …to a Sophisticated Wine Bar Mural. The wine bar is a 360-degree experience, from the; striking taste, pungent smell, encapsulating visual and relaxing noise. So, forming that picturesque visual to tip off the experience that the customer desires are what 3D Wallpaper Murals does best. Designing the atmosphere of a wine bar is not an easy task, recreating the mood of relaxation and vintage sophistication is dynamic to every wine bar’s success. From a casual easy-going atmosphere to an elegant classic ambiance a mural would fit nicely to finish off the sensual burst that is just right. The right choice for you and your business.